Lake City administrative offices (City Hall) is located at 205 North Marion Avenue, Lake City, FL 32055; phone: 386-752-2031. Photo: T.G. Henderson House (Henderson-Marcello House), ca. 1894, 207 South Marion Street, Lake City, FL. Listed on the National Register of Historic Places in 1973. Photographed by User:Ebyabe (own work), 2007, [cc-by-3.0 (creativecommons.org/licenses/by/3.0)], via Wikimedia Commons, accessed June, 2014. 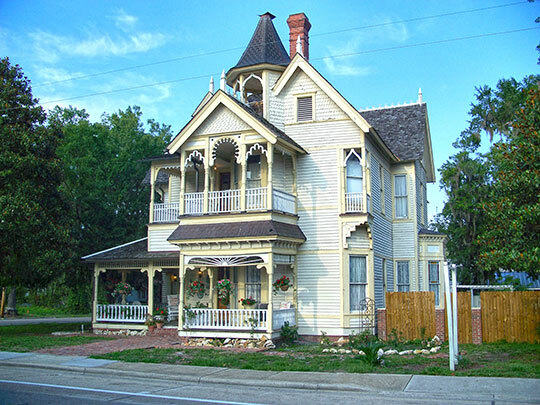 The Lake City Historical Museum is located at 157 Hernando Avenue SE, Lake City, FL 32025; phone: 386-755-9096. Lake City, seat of Columbia County, was known as Alligator before 1859 because of its proximity to an Indian village ruled by a Seminole chief of that name. It is a town of narrow brick-paved streets radiating from a central square. A post office of Spanish design and the old courthouse with a clock tower overlook the square. In the residential districts old houses shaded by large oaks and set in spacious lawns stand beside trim modern dwellings on formal landscaped terraces. Chief Halpatter Tustenuggee (Alligator), one of the craftiest of the Seminole, was one of the leaders in the Dade Massacre in 1835. Induced by General Jesup to leave Florida for Indian territory in 1841, Alligator was later employed by military officers to persuade his tribesmen to capitulate and submit to removal from the State. Lake City, center of good farming country, was one of the important towns of early Florida. From 1883 to 1905 it was the seat of the State Agricultural College, later removed to Gainesville. Lumber, naval stores, and tobacco are its chief sources of income. The United States Veterans' Home and Hospital on US 41 in the southern section of the town, established in 1920 for white and black veterans of all wars, comprises a group of 9 brick buildings on landscaped grounds; the main unit is a hospital with 300 beds.